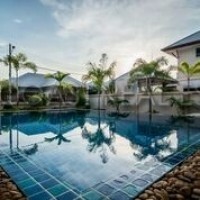 Unique opportunity to purchase these 2 houses, side by side on Permsub Garden Resort. Each house has been totally stripped back and fully renovated "top to bottom". One is 3 bedroom with 3 bathrooms, and the other 2 bedroom and 1 bathroom. Both have brand new European Kitchens, new bathrooms, flooring, full furniture, Eco air conditioning throughout, plus there is also the latest design roof insulation, a complete re-wiring throughout the homes, full Upvc windows and doors and even the roof tiles have been re-sealed and painted. Both could be rented out, or live in one and collect income from the neighboring house. Permsub Garden Resort is a quiet residential village and features 24 hour security, a large communal pool, a fitness center and an on-site convenience store. It also has on its grounds an International School, catering for children from kindergarten age to 16 years old. The village is located just off Siam Country Club Road, close to many Thai markets, convenience stores and easy access to the 7 motorway. The houses are registered in company name, allowing easy and inexpensive transfer.